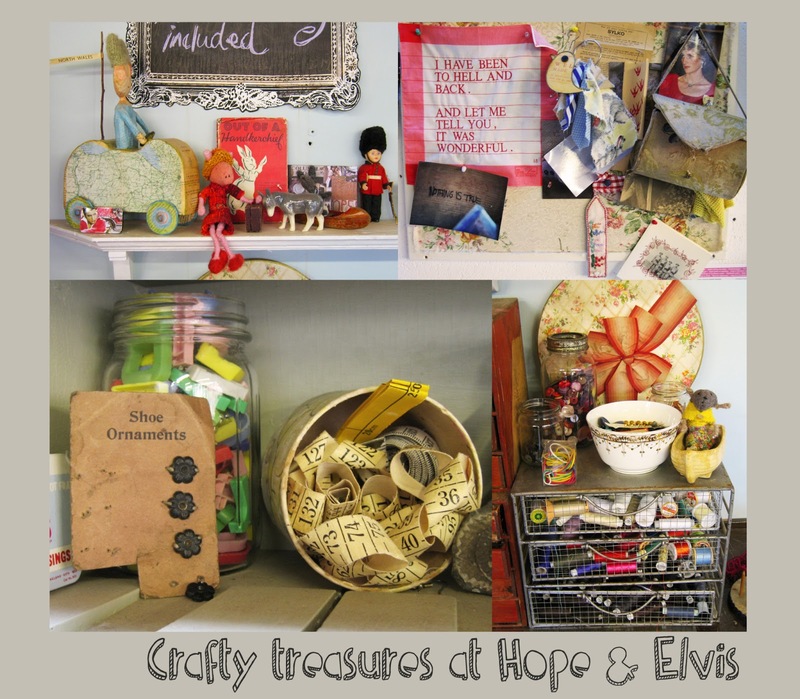 It is always a pleasure to return to Nottinghamshire, especially when I am visiting the beautiful Hope and Elvis studio run by Louise Presley. The purpose of my trip on Saturday 2nd February was to take part in a workshop with the lovely Sally Falkner. Sally is an interesting character, not only is she an artist but she also practises as a therapist and social worker. These experiences really shine through in the tiny, nostalgic creatures that she makes. Each one of Sally’s creatures has its own intriguing story to tell. This is partly due to the vintage cloth that they are made from and partly from the real life narratives that Sally weaves into her work. 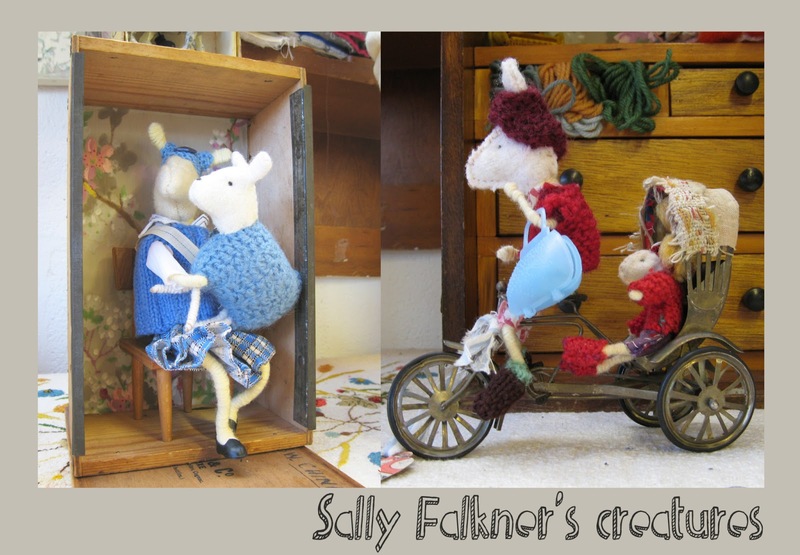 Sally states that she uses the “traditional toy making method of winding wire onto a frame.” Initially she models a wire frame for the creature. 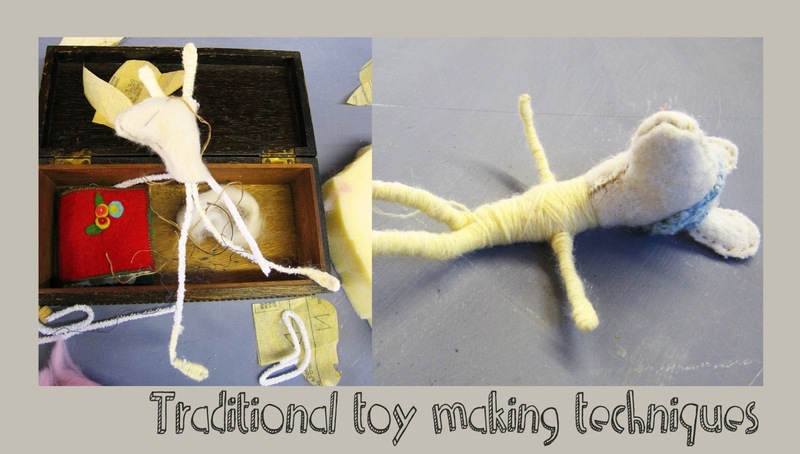 This is then followed by wrapping the ‘body’ with wool and later cloth to add form. The head is made from old blankets which are stitched together, stuffed and joined to the body. The ears help to keep the structure of the body in place and add character. The creatures evolve through the making process and are led by Sally’s experiences and also her current treasured finds from car boot sales or charity shops. As a lover of our feathered friends, I had set my heart on making a bird like creature under the guidance of Sally. I found the experience of creating without producing initial drawings quite interesting, as it allowed me to play more freely with the materials on offer. I was really surprised that my creature started to take on the form of a goose as I had imagined that I would create a smaller and more delicate bird. I was also drawn to the muted colours of old lace and doilies instead of the bright, patterned cloths that I would normally use. I have to confess that I have yet to complete my creature. I have progressed to making an apron from a vintage tablecloth for the goose. 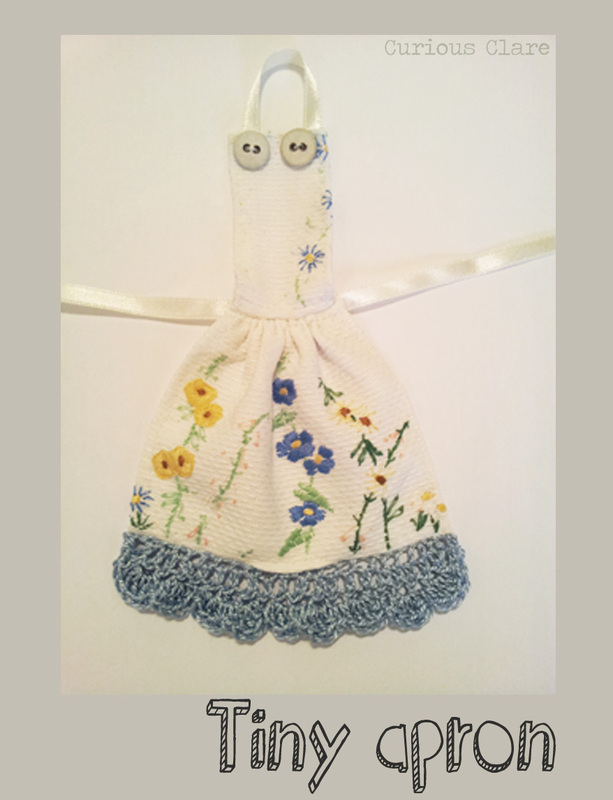 I am particularly pleased with the crocheted ‘frill’ at the bottom of the apron. I made this by adapting a crochet rose pattern given to me by Jo Johnson at French Knots Craft Studio. 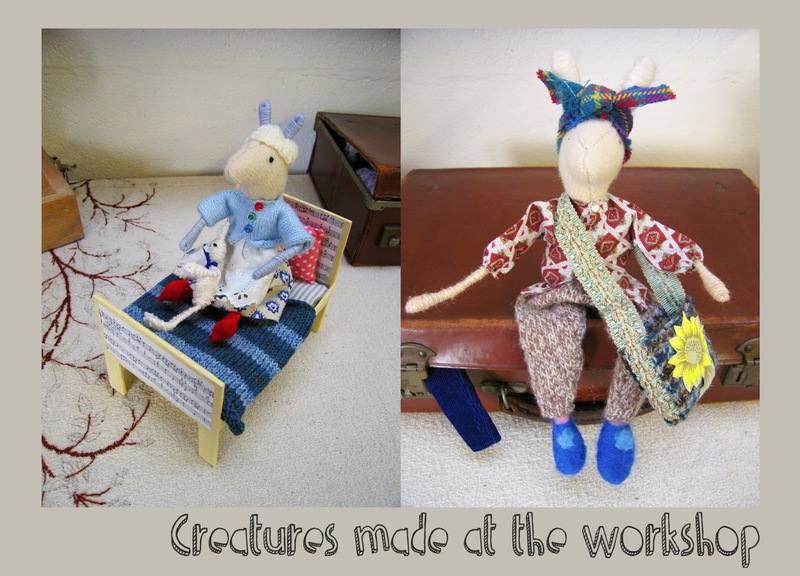 I am hoping to finish off my creature with a hat and shoes before giving her away to my mum who seemed quite taken with her! I was impressed with all the different creatures that people made and the fantastic accessorising that went on. Two of my favourites can be seen below. I love the land girl feel of the creature on the suitcase and the gorgeous hand knitted cardigan of the character on the bed made by Anne of Angel Eden. I think that it is fair to say that everyone invested their own stories and personalities into their creatures. Thanks Sally and Louise for an enjoyable and busy crafting day! Thanks Louise, always a pleasure to visit your studio. Hoping to finish my creature soon! 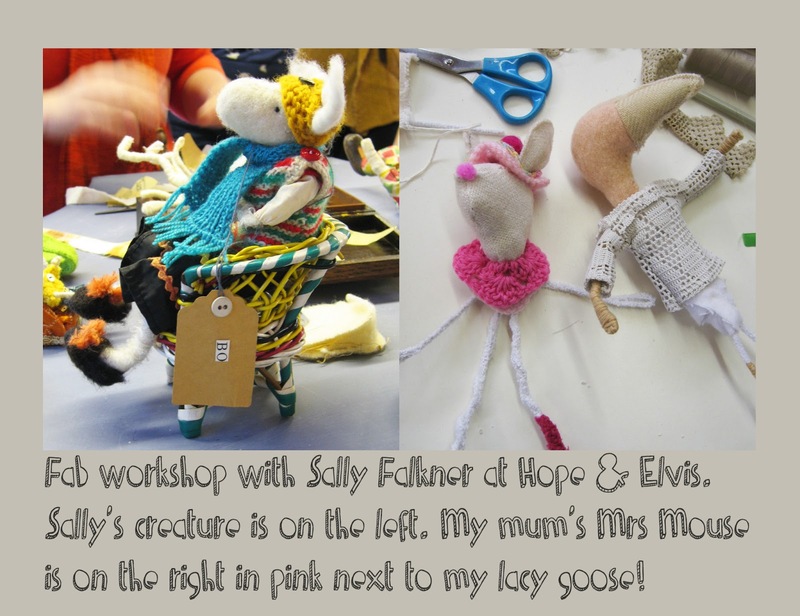 What an inspiring workshop, I can't wait to see your finished goose. Thanks Jo, working on the hat this week!